Although just a little (LOT!) 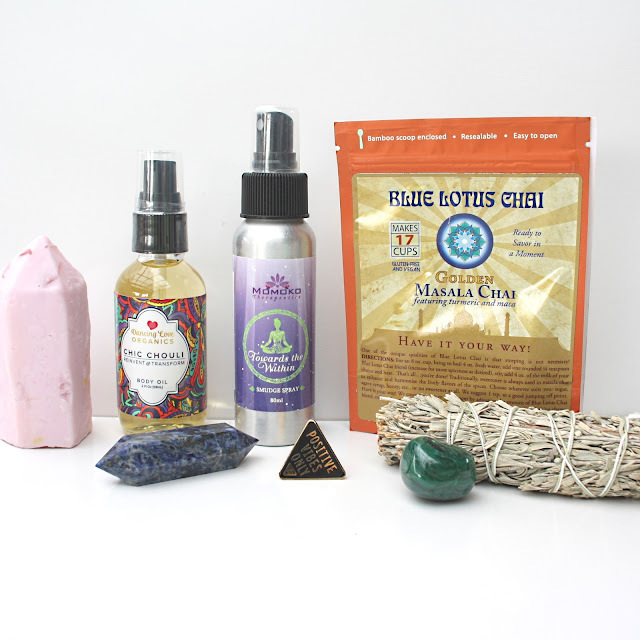 overdue, I wanted to share my thoughts on the September Box from Goddess Provisions. I hadn't heard of Goddess Provisions until they contacted me asking if I wanted to try out their box, and when I seen that it contained crystals, tea and other spiritual goodies, the inner hippie in me couldn't have been more excited. Keep reading for my thoughts on the September Box from Goddess Provisions. 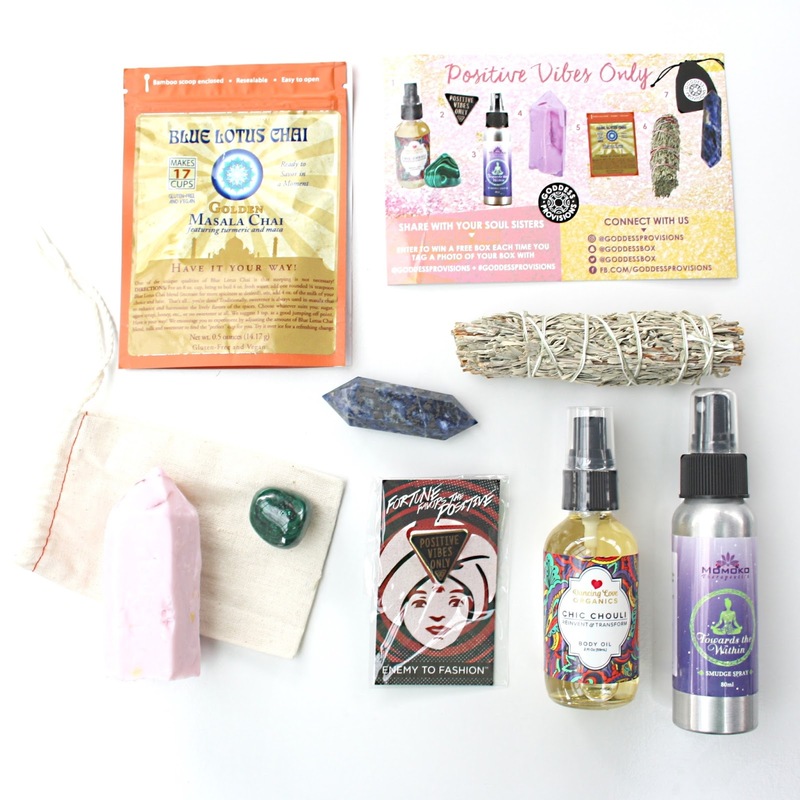 Goddess Provisions has curated a monthly subscription box that is filled with 4-6 full-size products + samples of a selection of crystals, aromatherapy, tea, snacks, beauty, and tools for spiritual growth. It is 100% vegan and cruelty free, and ships worldwide! The theme for September's box was 'Positive Vibes Only - Radiate Good Energy'. 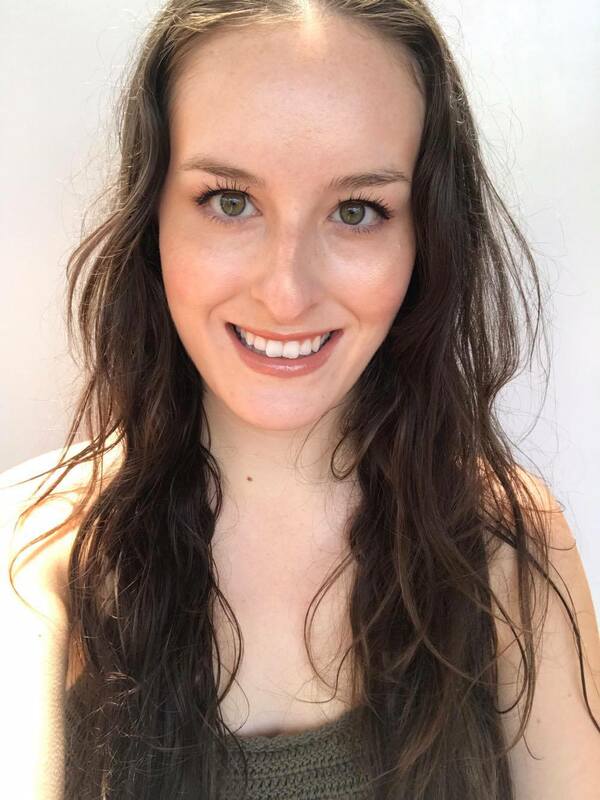 I thought I would give a run-down of each product included, the $ value, and my thoughts. Patchouli remixed with a unique, softened aroma meant to ground and inspire you. Follow the ritual card when applying this body oil and connect with the Malachite stone to set the tone for a day full of gratitude. Thoughts: This is a beautiful bottle, and I love the idea of having a ritual when applying a body oil. Any second you can get to connect to the current moment you are in is a positive thing. The malachite stone is a beautiful deep green colour, and its size makes it very portable. Wear this pin as a reminder to spread good vibes. They're what you and the world really need. Thoughts: This pin is so cute! I have already reserved a space for it on my backpack. I love little reminders to set good intentions and think positive thoughts for the day. This liquid smudge spray combines Palo Santo, Egyptian Frankincense, Sage and a blend of essential oils to help cleanse yourself and your home of negative energy. Out with the bad vibes, in with the good! Thoughts: This is such a clever idea! I am always misplacing lighters and matches, so this spray would come in handy for those times when you can't light your smudge stick, or you want a more portable solution. 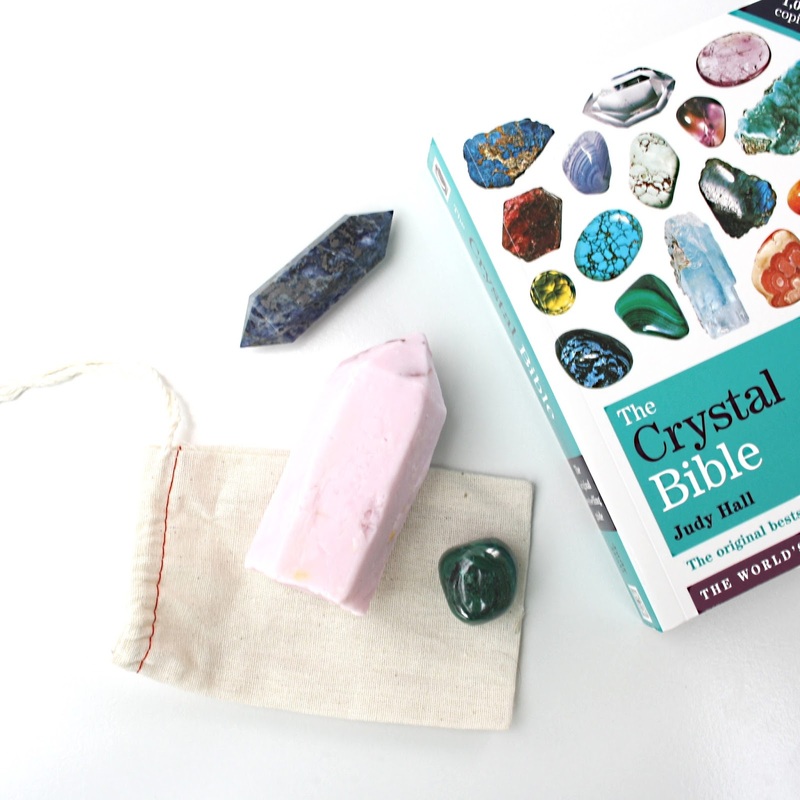 This would be a great product to carry in your handbag or in the car for this emergencies when you are having a bad day and feel like you are absorbing and reflecting out negative energies. Pink grapefruit scented crystal point soap that was handmade in small batches with lots of love. Almost too cute to use, but goddesses are totally worthy of ridiculously cute soap. Thoughts: This soap is so lovely and hydrating and smells beautiful! It's probably the cutest thing to enter my shower (so cute I didn't want to use it!). Instant chai tea is taken to the next level thanks to the addition of Turmeric, known for its anti-inflammatory benefits, and Maca, known for its mood and energy boosting qualities. Thoughts: I love chai so was excited to see this included in this box. Any chai is delicious, so obviously this tea has my heart. Love to see those added superfoods too! Burn this sage stick to cleanse your space form any negative energies. Blue sage can be used in a ritual ceremony, house cleaning or simply for aroma pleasure. Thoughts: I love to burn sage, so was thankful to get a smudge stick in the box. I find it great for clearing negative energies out of a house, or for you if you feel like you are full of negative thoughts and energy. I find it puts me in a better head space. Sodalite is a stone for communication and is strongly linked to the throat chakra. It's great to have around during times of transition when you're finally ready to speak your truth. Sharing your truth isn't always easy, but it creates space for good vibes to flow to you. Thoughts: My favourite item in the box! I have a small but growing crystal collection, and love to collect crystals that speak to me on a vibrational level or physical level. This is a crystal I was unfamiliar with, but couldn't have arrived at a better time for what I am currently going through in my life. It's like Goddess Provisions read my mind! I loved this September box from Goddess Provisions, and would love to try more out in the future. I hope this review was useful for you guys! If you are interested in subscribing to Goddess Provisions' Subscription Box, head to their website to sign up! Hi.. you haven't written anywhere how much the box would cost ? Hi! All the info is on the website, the box is $33 USD per month to subscribe to.